What if we can make ourselves, our communities, and our planet healthier all at the same time by moving our bodies more? Unapologetically direct, often hilarious, and always compassionate, Movement Matters demonstrates that human movement is powerful and important, and that living a movement-filled life is perhaps the most joyful and efficient way to transform your body, community, and world. This is one I will listen to many times! Katy’s got me thinking about how little I move and how much I take for granted. For me personally, this book is a life changer! It’s made me look outside myself to see how my sedentary lifestyle effects not only my own health but the lives of others and the environment around me. It’s time for a change! Love, love, love Katy Bowman and her heart of gold! Informative? Absolutely! You will learn volumes here but it's all spoken with a passion and an "I believe in you" spirit that got me skipping the gym and doing about a million squats to clear the cabin yard of flammable pine cones with the happiest sweat ever! I love the principles Katy teaches but even more, I love the fabulous beginner ideas she suggests. TV is now unacceptable unless I'm simultaneously stretching my glutes on the floor. And I can't wait to find some elderly neighbors with a lemon or fruit tree for whom I can harvest. It is an amazing concept, this outsourcing that Katy discusses throughout the text. I cannot believe how many ways it applies now that my eyes are open. I feel like I took the blue pill, or is it the red? I always mix that up. Whichever one allows you to see what's really going on (or the matrix). This is one of those special books that help us get familiar with the eye opening content that tends to abide in the "don't know that we don't know realm". And then helps us take action once we know! Be sure to catch "Move Your DNA" and "Whole Body Barefoot". And the "Fix Your Feet" one is a lifesaver for me. I'm finally back to long walks again. Enjoy them all! Thank you Katy! I probably walked 20 miles and cooked several dinners "reading" this one. Really makes you question modern lifestyles and the quality of the science behind what is normal for human beings. The first three hours of this book were good. Though the author is rather annoying to listen to although she brings up good some great points. The last few hours of this book are an absolute waste of time. Pointless rambling that leads nowhere. About an hour of thanking people and referencing books she’s read and how the book came together. Then she sings. Why? I don’t know but it’s not enjoyable. I have and will recommend this audiobook to many friends. Katy Bowman's writing has always been transformative for my body, and this book, should we read it and take its message to heart, will transform the earth's body as well. This is far from an exercise book--it's a critique of our entire sedentary culture, as well as a map for changing it. The performance is fantastic and the blooper reel at the end is a hilarious bonus! Katy Bowman has really helped clarify so much about the importance of movement in women's health. A great primer on why movement matters and ways we can bring more of it into our everyday lives. Honestly the idea of the book is amazing. It makes complete sense and I commend the author for realizing the simple point. I've started to, kind of, do my part by walking barefoot more and getting off my smart phone so much. But, it is so ingrained into us as a society that it will be very hard to change. But she has started and is forging ahead. Would you consider the audio edition of Movement Matters to be better than the print version? Katy Bowman might be my favorite audio author thus far. Her voice carries an inflection that would make reading the ingredient list on a cereal box sound interesting. Coupled with her hands-on experience and real life usage, her books are spot on. Have you listened to any of Katy Bowman’s other performances before? How does this one compare? 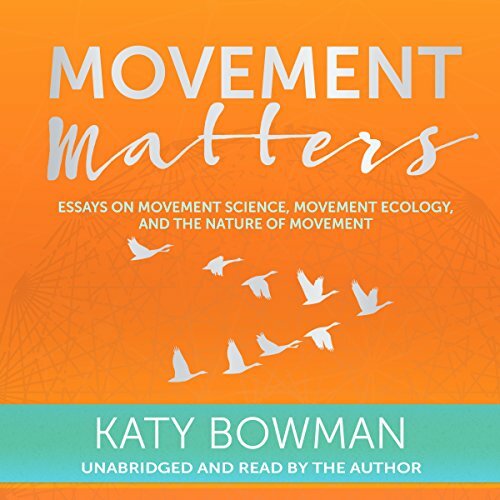 I've listened to all of Katy Bowman's books, and her latest, Movement Matters, is just as great as the previous ones. Katy has a knack of narrating which makes the listener feel as though they are in the same room, having a face to face conversation. She's honest about opinion vs. fact based science, and isn't afraid to admit, "here is the information, take it as you will"
I cannot express how beautifully his book is written, how wonderful it is to hear it rea by the author and how incredibly important the message is. I wish I could get everyone on the planet to read this book! What disappointed you about Movement Matters? The foreword was written by a man who talks about his "privilege" being born "a white, middle-class male." Such nonsense was followed later by the influence Ms. Bowman had in his life, and how walking exposed him to many terrible things like "the faces of young black men asking for your help as they are stopped and frisked by the police for no reason at all. "I continued reading despite the foreword, but found this book was not as engaging as Ms. Bowman's "Move Your DNA." "Movement Matters" seems forced. I couldn't go beyond Ms. Bowman's long, passionate explanation on how she did't say treadmills are "bad" but that they are "different." She described how she keeps herself up to date, and I believe she is right about being open to new studies and innovation; I just can't keep reading this book. I will wait for her new, updated edition of "Move Your DNA."